No matter what you call your back pain, be it a herniated disc or ruptured disc, the result can be quite painful. Closely related is the condition known as bulging disc, and all three are the subjects of this comparison article. Bulging disc is the term used to refer to an injured disc in the spine in which the protrusion is less than 3mm. A herniated disc is a similar condition in which the disc protrudes as well, although the annular fibers still exert some holding power on the disc's nucleus. Ruptured disc is another name for a herniated disc, although it is most often used to refer to a condition that results from injury or trauma. A bulging disc is so-called because the disc extends outside the area that it would normally occupy. In most cases, the bulge is comprised of a fairly large section of the disc, giving it the appearance of a hamburger patty that has exceeded the size of its bun. A bulging disc is considered a normal part of aging, and it typically shows up in an MRI. A herniated disc occurs when a crack in the outer layer of the spine causes part of the disc’s internal material to protrude. This is pretty much what happens in a ruptured disc as well. Bulging disks are quite a bit more commonplace than herniated discs, although the latter condition tends to be more painful. That being said, some people who suffer from one or the other experience no symptoms at all. 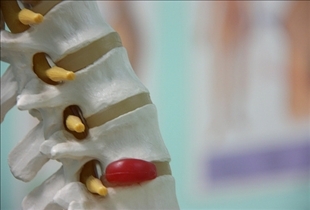 A rupture in any of the discs of the spinal column can cause some of the inner substance to protrude, causing irritation to the nerves of the spine. When this condition occurs in the lower back, the person may experience sciatica, which is characterized by pain or numbness in the lower back. This pain may even extend to the buttocks, the back of the leg, and even the foot. As mentioned previously however, some patients may feel no pain at all. A pinched nerve is a common result of a herniated disc, although the condition may cause a number of other health issues as well, including spinal stenosis, tissue swelling, and bone spurs in which the nerve roots of the spine are subjected to pressure. Herniated discs most often occur in the lower back, since this part of the body is prone to a lot of stress. If the condition occurs in the neck area however, the patient may experience pain, numbness and/or weakness in the arms or hands. Which back problem is most annoying? I NEED SURGERY FOR THE RUPTURED DISK. SHOTS LAST 2 DAYS AND THEN BACK TO UNBEARABLE PAIN. CAN't work, sleep off and on and pain pills last about 2 hours.I have tried several pain pills. doctors try to mask problems instead of solving problems. You know I am 47 and I sure wish someone would explain this to my new pain RN assistants. I had a herniated disc for 30 years so they called it. Then I had a different disc rupture. I have all the MRIs and can tell u that they are not the same. Back in the day when I was 18 a budging disc and herniated disc were used interchangeably. And you could plainly see the bulge/herniation on a MRI. But my rupture was the complete loss of the inside of a disc below that one. Contents spilled out all over the MRI and u couldn't even hardly see the spinal cord at all. It was like looking at the black sky with white stars. A laminectomy cleaned up the debris and caused a multitude of other problems. Eight years later I still am having severe chronic pain in my lower back and my new pain doctors are naptime is no reason for my pain and my body heals itself laughing out loud. I also got arachnoiditis which they told me was an infection and I said no it's an inflammation of the surrounds the spinal cord Syringomyalia is the term infection of the spinal cord that is sometimes company by arachnoiditis. She says that I have no more arachnoiditis and I try to explain to them you never get rid of arachnoiditis it come and go with information depending on how much strain you put on it if you thought there etc. I at least had to fight with her on that part because I wasn't going to get into the semantics of bulging versus herniated versus ruptures with her she's young and she just doesn't seem to understand that we are all different and we all can have different amounts of inflammation and pain. And of course they are now trying to take away all of my pain medicine and I am in excruciating pain and I don't know where to turn . Varicose Veins vs. Spider Veins: Can You See Veins? Bad Breath vs. Good Breath: Could You Pass The Test? Blonde vs. Brunette: What's the difference?